Freemasonry means different things to different people. Ask ten Freemasons what they do and why they do it and you’re likely to receive ten different answers. But common to every variation of answer will be the strain that Freemasonry makes good men better, being as it is a system of self-improvement tried and tested over centuries. The uneducated with no interest in mystical traditions and the esoteric may regard Ancient Egypt as little more than a place of pagan worship, strange hieroglyphics and monuments erected by thousands of Hebrew slaves. But those more learned, especially those having undertaken the initiative rituals of Freemasonry, will see a link between the Egyptian metaphysical tradition and modern mystery schools, of which Freemasonry is one. Ancient Egyptian history author, Alphonse Mariette, wrote of the Egyptian mystery schools, “To the initiated of the sanctuary, no doubt, was reserved the knowledge of the god in the abstract, the god concealed in the unfathomable depths of his own essence. But for the less refined adoration of the people were presented the endless images of deities sculptured on the walls of temples.” The very same could be said of Freemasonry. It is Freemasonry’s aim to educate an initiate on the god concealed in the unfathomable depths of his own essence, represented by the letter G in the middle of the square and compasses, symbolizing the divine spark within, the god essence of oneself. The Christian Priest, Origen, said that, "The Egyptian philosophers have sublime notions with regard to the Divine nature, which they kept secret, and never discover to the people but under a veil of fables and allegories.” Once again, we see the similarities to the teaching methods of Freemasonry which is performed by way of symbolism and allegory and never revealed to the uninitiated (known as cowans). Another link between modern Freemasonry and Egypt is the Isis - Osiris story that formed the crux of the Ancient Egyptian belief system. In the Egyptian rites, Horus is the savior-avenger, son of Isis, magically conceived through ritual after the brutal murder of her husband / brother Osiris. We can apply this myth to modern Freemasonry’s allegory of the murder of Hiram Abiff, the chief architect of Solomon’s Temple. Isis, made a widow by Osiris’ murder (Freemason’s are called Widow’s Sons), gives birth through initiation ritual to Horus, the redeemer, raised solely that me may avenge the destruction of wisdom (by Set aka chaos) and restore peace, harmony and the just god, in whom there is no death (the Divine Spark within). Other similarities between Freemasonry and the Egyptian Mystery Schools are seen in certain Masonic symbols and initiatic procedures. When he first enters a lodge room for initiation, the candidate for Freemasonry is blindfolded and has a rope tied around his neck by which he is led in a circuit of the room. This rope is called a cable tow. The cable tow is purely Masonic in meaning and use, but as with many Masonic symbols it is rooted in antiquity. Vases from ancient Mexico have been unearthed that show candidates proceeding through a ceremony of initiation in which they are being taught a sign while wearing a noosed rope around their necks. In the religious ceremonies of the Brahmins, Greeks and Druids, halters were worn around an initiate’s neck. In the mystery schools of Ancient Egypt, a chain was placed around a candidate’s neck as part of his preparation for initiation. As in Freemasonry, the Egyptian candidate was also blindfolded to represent a state of darkness before emerging into the light of knowledge when the blindfold was removed. When a candidate becomes a Freemason, he is presented with a white apron consisting of a square overlaid with a triangle. The apex of the triangular flap represents the divine spark we must endeavor to recover. It is the part of us made in the image of our Creator, and there’s no better geometric figure to symbolize this than the triangle. After all, geometrically a triangle is the very first shape that can be made by drawing straight lines. This is why the number 3 was venerated by the ancients and still is to this day. In Judaism, the triangle represents the past, present and future. To the Chinese: heaven, earth and water. To the Hindus: creation, preservation and renewal. The three points of the triangle also represent the conscious mind, the subconscious mind and the collective unconscious. The Ancient Egyptian ceremony of initiation led the candidate to a door shaped exactly as a Masonic apron: a triangle over a square, symbolizing his progression from an earthly, material existence (square) into a heavenly, spiritual existence of higher learning (triangle). The Masonic symbol of the Point Within a Circle inside two parallel, perpendicular lines is steeped in antiquity. Early Egyptian monuments have been discovered inscribed with the symbol of God — represented by the Alpha and Omega — in the centre of a circle bordered by two perpendicular, parallel serpents. In many ancient belief systems and mystery schools, a circle was used to symbolize God as, like a circle, God has no beginning and no end. One of the emblems of the third degree of Freemasonry is the honeycomb. Many ancient civilizations revered bees and honey. The Ancient Egyptians developed methods of advanced apiculture as far back as 3000 BCE. 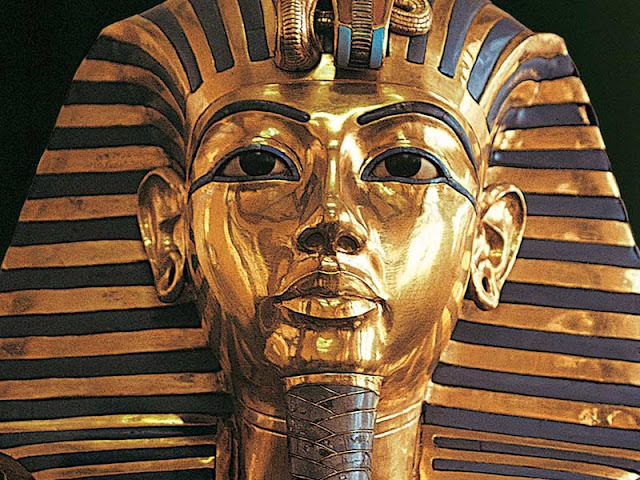 Menes, the first King of Egypt, who ruled somewhere between 5000 BCE to 4000 BCE, was called ‘The Beekeeper’, a title bestowed on all subsequent Pharaohs. Depictions of bees and honey are prevalent on many Egyptian carvings including the Flamic and Pamphilic obelisks, the obelisk of Luxor, the pillars of the Temple of Karnak and on statues of Rameses II. Even the Rosetta Stone, which dates to 196 BCE, was etched with pictures of bees. Royal tombs in Egypt also show the importance of beekeeping and honey, including the enormous sarcophagus of Rameses II which includes numerous pictures of honeybees. Foodstuffs created by bees, such as pots of honey, honeycombs and honey cakes, were placed by the sarcophagi as food for the gods. Even Alexander the Great requested that his body be wrapped in honey upon his death. "We shall find that the old Egyptians had so great a regard for silence and secrecy in the mysteries of their religion, that they set up the god Harpocrates, to whom they paid peculiar honor and veneration, who was represented with the right hand placed near the heart, and the left down by his side, covered with a skin before, full of eyes and ears, to signify, that of many things to be seen and heard, few are to be published." "By no peril will I ever be compelled to disclose to the uninitiated the things that I have had entrusted to me on condition of silence." The best known champion of silence and secrecy was Pythagoras, who ventured to Egypt to study the Mysteries, which he later brought back to Greece. To become a member of the Pythagorean School, an initiate took an oath of silence for two to five years. Novices were called ‘Listeners’ and were not permitted to partake in class discussions, but only to listen so the teaching could be absorbed before entering into an intellectual debate on what they learned. The connections between Ancient Egypt and modern Freemasonry are many, and only a few are presented in this article. To say that Freemasonry was born from the Egyptian Mystery Schools and their initiation rituals is true in part. Nobody can claim to know the full history of Freemasonry and the origin of each of its symbols. The Egyptian Mystery Schools played a part in its development, as did those of the Greeks, Romans, Druids, Essenes, Cathars, Rosicrucians, Alchemists, and the guilds of the Medieval Stone Masons.